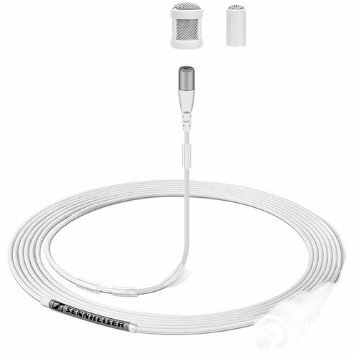 Whether for musicals and live shows, or for broadcasting applications, the MKE 1 – Sennheiser’s smallest clip-on microphone – performs at its best in all situations where a microphone needs to be virtually invisible and still offer outstanding sound quality. Reliability: Sweat protected by a newly developed protective membrane, the MKE 1 stands up better than other clip-on microphones to harsh live conditions. Its special gauze and multi-purpose cap offer additional protection from moisture so that it only picks up what it is meant to pick up – perfect sound. The MKE 1 is robust in every respect. The Kevlar™ reinforced cable with moulded anti-kink sleeve minimises handling noise and makes this a microphone you can rely upon completely.